I'm just popping in today to share the latest and greatest deal on the Silhouette. Oh how I love my CAMEO! I have spent many hours getting to know my CAMEO since I received it just a few months ago. The creative possibilities really are endless! I teach the Young Women at church, and I have loved making cute hand-outs and paper crafts to go along with my lessons each Sunday using the CAMEO. Because I am a bargain girl, I really do love to help spread the word about a good deal. Especially when it comes to the Silhouette. 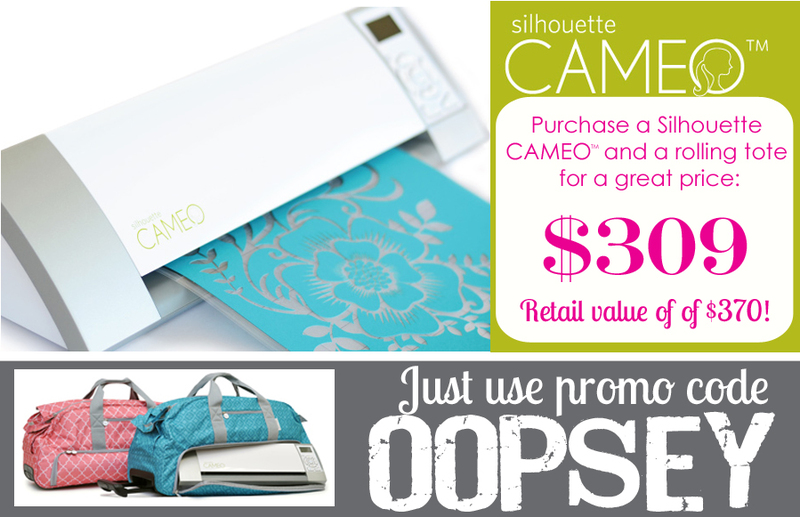 This month, there is an incredible bargain on the Silhouette CAMEO® rolling tote. The rolling tote is a genius idea! Before receiving my tote, hauling my CAMEO to craft night was much more difficult. The tote has plenty of room for my CAMEO, laptop, cutting mats, and all of the accessories! It is available in both pink and teal. 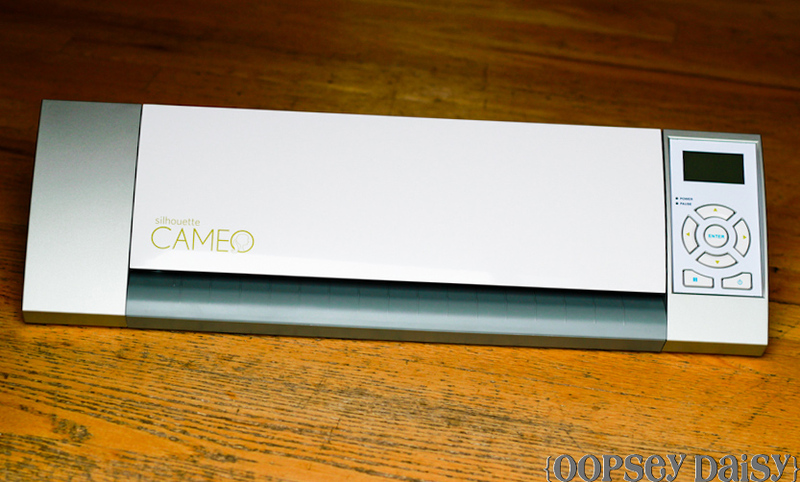 You can save about $60 purchasing a CAMEO and a rolling tote for the price of $309 (instead of $370). If you already own a CAMEO, you can still a purchase a rolling tote at the discounted pride of $54.99. Just use code "OOPSEY" at the unique link above if you're interested. Remember the stenciled mason jar vased with flower love notes that I shared earlier this week? Well, Mother's Day is just around the corner, and I needed a card to go along with my Mom's gift. So yesterday I set to work creating a card for my sweet Mother. Cards mean a lot in our family. My parents almost always tear up when they read our cards--every birthday, Mother's Day, Christmas, etc.! And my Mother saves each and every one. 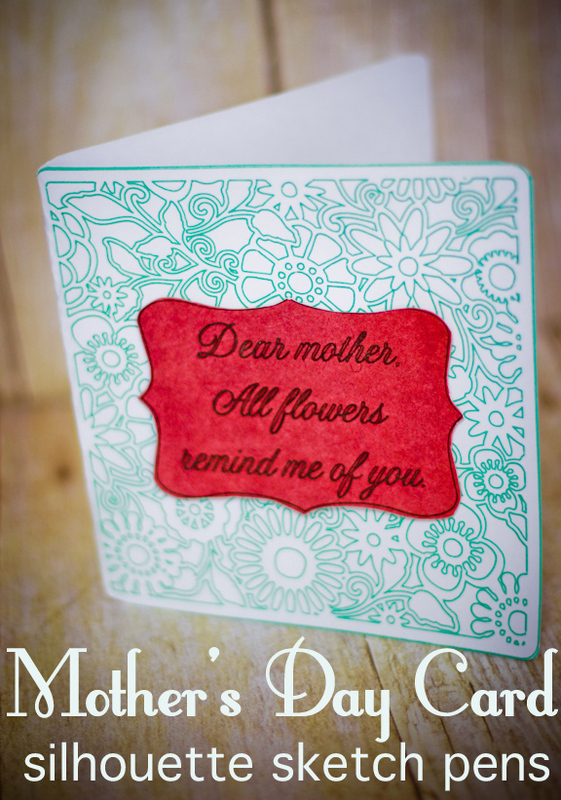 I used some Silhouette sketch pens to create this quick and easy Mother's Day card. Say hello to my brand new CAMEO! This beauty arrived on my doorstep just a few short weeks ago. I am in LOVE, my friends. I have long supported both the Cricut and the Silhouette--as equally as I possibly could. I have seen pro's and con's to both machines. However, this week I have really gotten to know my CAMEO. The Silhouette Studio® Designer Edition software is beyond incredible! I am excited to practice even more! BUT my lil' machine came to me with a defective blade. So I put my thinking cap on to create a project that did not require any cutting. Instead, I wanted to practice a bit with my new sketch pens. I was given a pack of glitter sketch pens and metallic sketch pens. Aren't they pretty? I learned a little trick along the way. It appears that the sketch pens work best if the paper has not been touched. If the paper has any oils from your fingers, the image shows up only part-way. The rest was simple! I inserted the sketch pen into the blade holder, designed the card and image in the software, and it came out beautifully! This image is butterfly_floral_lace_square_C00500_19210. One of my Mother's favorite songs is "I Often Go Walking", and I wanted to use one of the lyrics for her card. My Mom loves flowers. She could spend all day long in her garden. Everything about flowers makes me think of my Mother, so this lyric was just perfect. I used the black sketch pen to sketch the tag and the words on burgundy cardstock. From April 24-30, Silhouette is offering a screaming hot deal on a brand new Silhouette CAMEO™ plus a special deal on sketch pens! Curious about sketch pens? Well, sketch pens fit directly into the blade holder of your Silhouette making it easy to transform any digital design into a work of art. There are special sketch designs in the Silhouette Online Store designed specifically for use with sketch pens. 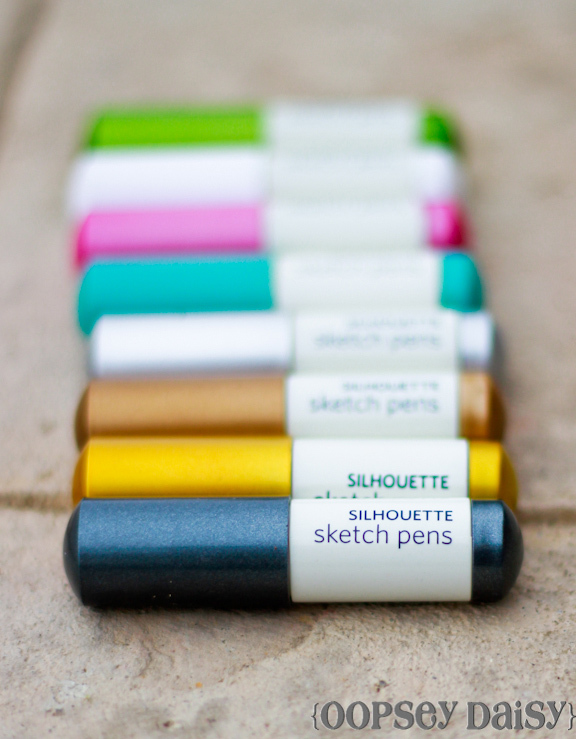 If you already have a Silhouette CAMEO™, you can still purchase the sketch pen packs for just $6.99. But all of the promotional deals can only be redeemed through a special link here. Don't forget to enter code "OOPSEY" at check out! 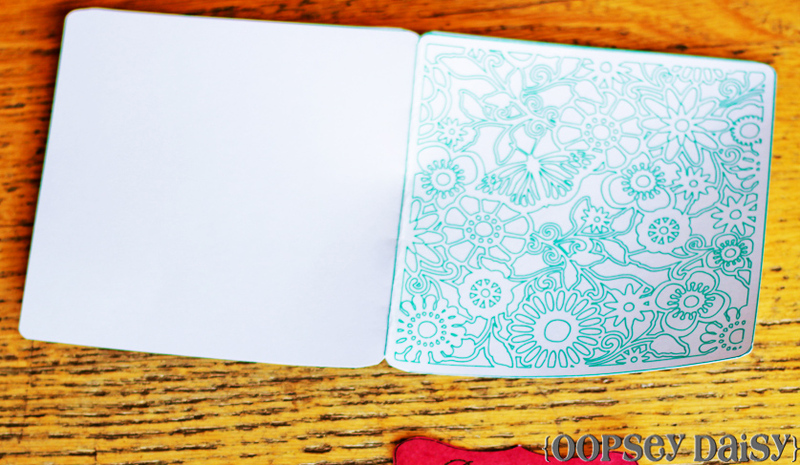 I can't wait to show you my very own project using the sketch pens coming up later this week! Don't forget to come back tonight for Wednesday's Wowzers! I forgot to mention yesterday how thrilled I am for spring's official arrival. We are soaking up lots of warm weather lately and playing outside with every chance we can get! For weeks, Little Man has been asking what day spring starts. Now he is dying to know when he can expect the ice cream truck in our neighborhood once again! I have just a few items of business this wonderful Wednesday! I look out for my readers and when I catch wind of an amazing deal... well, I am dying to share it with you! Enter code "OOPSEY" in order to redeem this excellent deal! This will only be good from March 22-28 so act fast! You will be saving some serious moola here! * You can open, manipulate, and cut .svg files. * You can create your own rhinestone designs. * You can sketch tools to convert designs into several styles of sketchable art. * The software includes creative knife tools to allow you to clip designs using different patterns. * There is an enhanced eraser set to modify designs with more precision. * You can use a built-in ruler and guide lines for precise alignment and drawing. Also... tune in tonight on my Facebook page. I want to try something new. I'm going to start What'cha Cooking Wednesday? I am always inspired around dinner time when I ask my Facebook fans what they are cooking for dinner. You people are gourmets! While I'm cooking hot dogs, I hear about leg of lamb! So starting tonight around 4:00 PM MST, I'm going to ask you what you're cooking! Leave a comment with what you're cooking for dinner and maybe a link if you have one. I can't wait to get some new menu ideas from YOU! I hope you rang in the New Year in style! You might know me as one of the only bloggers out there who still uses a Cricut. I stuck firmly to the Cricut forever--even after most other bloggers had made the big switch to the Silhouette. I actually own, use, and love both the Cricut and Silhouette. (Yes, it is possible!) I love things about both machines! But I do love all of the accessories and options that come with the Silhouette! 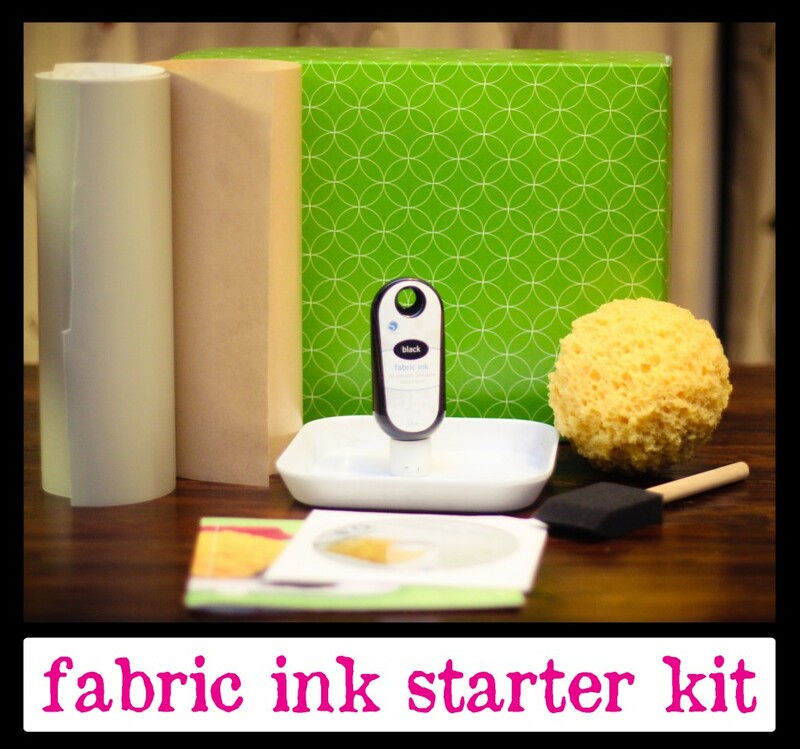 Last week, I tried out Silhouette's fabric ink starter kit. I love this kit! 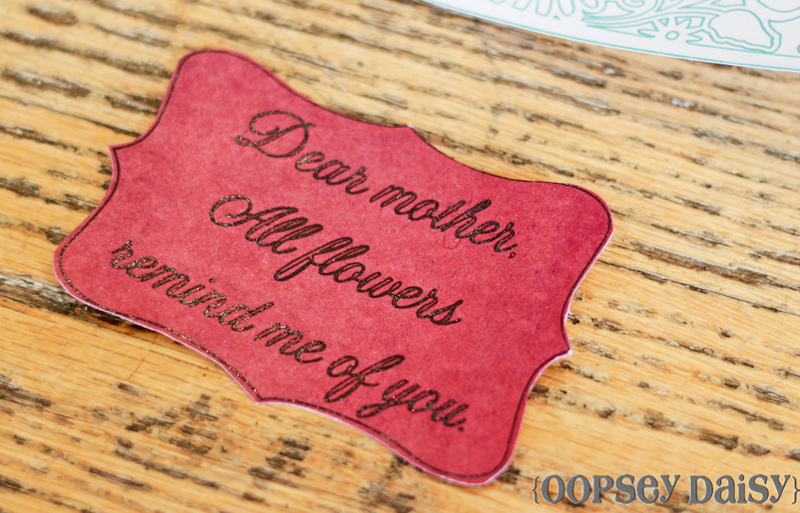 It's a simple way to create intricate stencils on fabric for a professional look. My baby sis was in town for the holidays, so we got together for some quality crafting time! My sister Kara went to school in London last summer, and thoroughly enjoyed her time there. 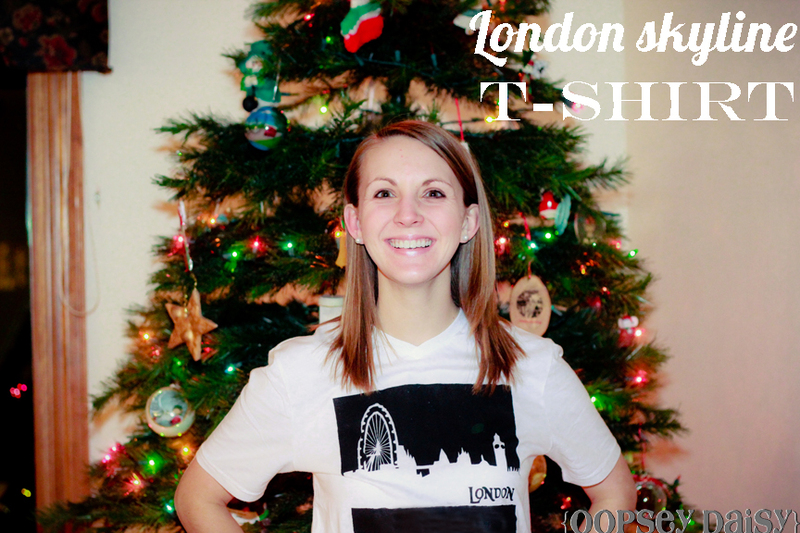 She adores all things "London!" We busted out the Silhouette fabric ink starter kit. 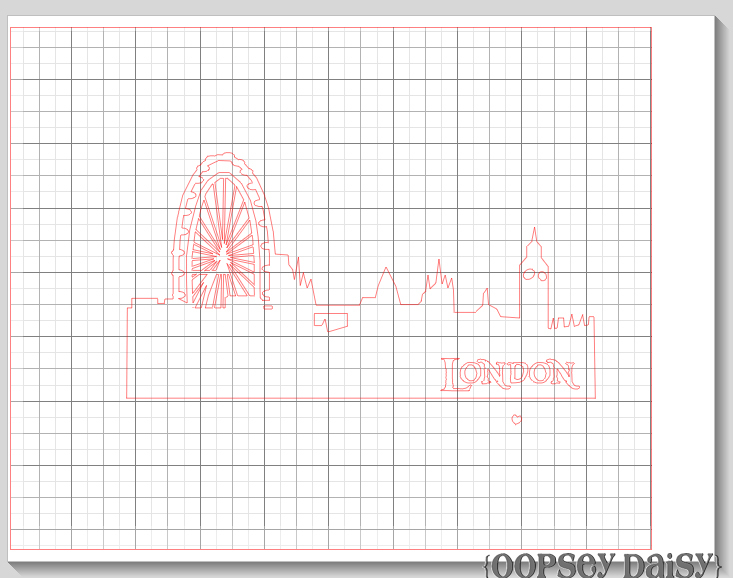 We found this London skyline image in the Silhouette library and sized it correctly using the Silhouette studio software. 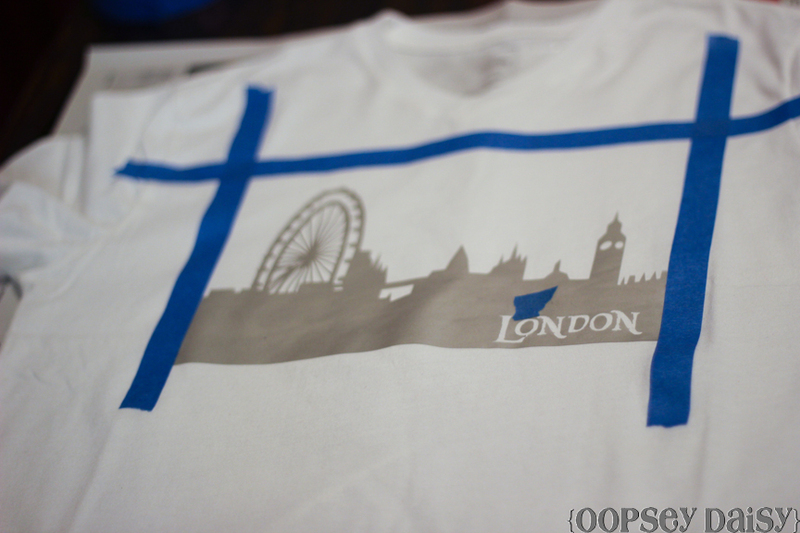 After cutting the stencil out of the vinyl, I used the transfer paper to apply it to the t-shirt. We used blue painter's tape to create a box for our design. I hope you are enjoying some yummy turkey today! Plus some mashed potatoes, gravy, stuffing, and even some pumpkin pie. No matter what's on the menu, I hope you're enjoying the ones you love! Once your stomachs are settled, maybe you'll start thinking about Black Friday. And I have some exciting news to share with you! I am super excited to tell you about the Black Friday Sale starting tomorrow morning at Silhouette! Just about everything in the Silhouette shop will be 30% off! Plus all of the images in the shop will be sold at just 50 cents! Awesome. But if you enter code "OOPSEY", you can get an even better deal. You can score 40% off!! 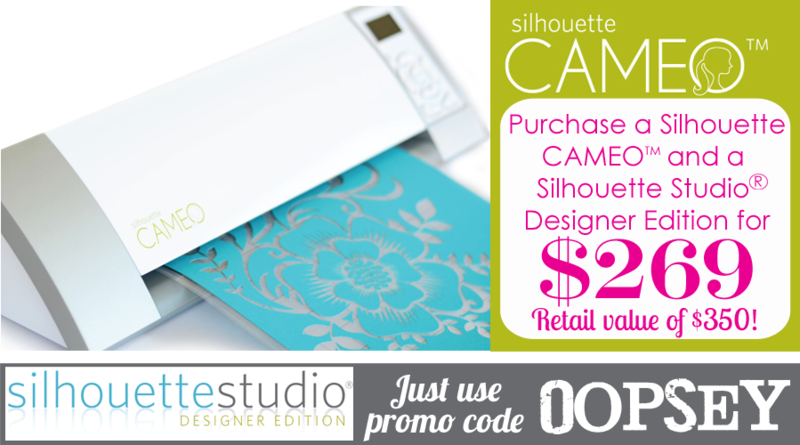 There is more GREAT news if you're looking to purchase a Silhouette CAMEO for Christmas. 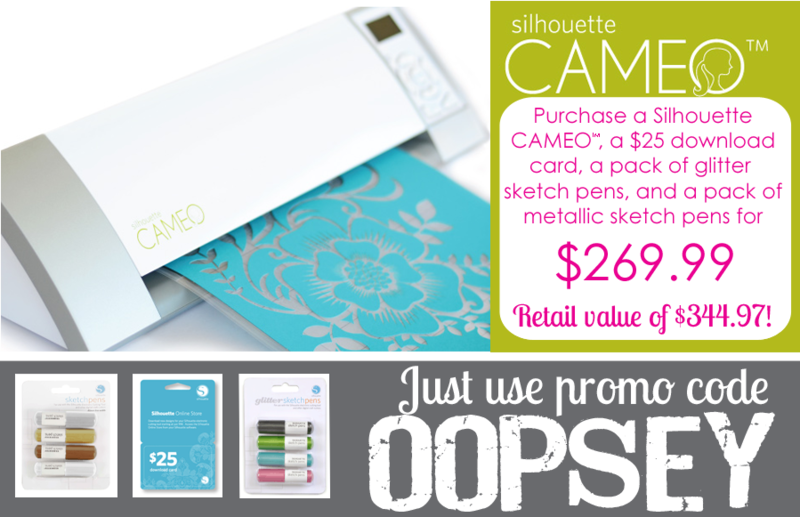 The Silhouette CAMEO will be heavily discounted! (Not quite 40% off, but still a GREAT deal!) The Silhouette CAMEO will definitely sell out. So if you're interested in purchasing a Silhouette machine, you will want to act now! You won't need a code to purchase the CAMEO, but you will need the link to the secret page. There is a "secret" page just for purchasing the Silhouette CAMEO this Black Friday. (It won't be available in the regular online shop... only at this exclusive link!) 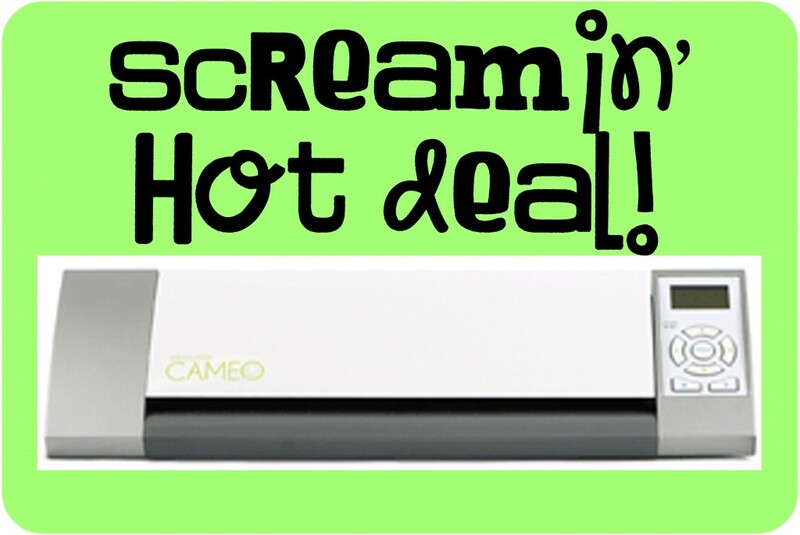 Your link to this screamin' hot deal is here. These HOT deals will only last from November 25-28. So hurry! 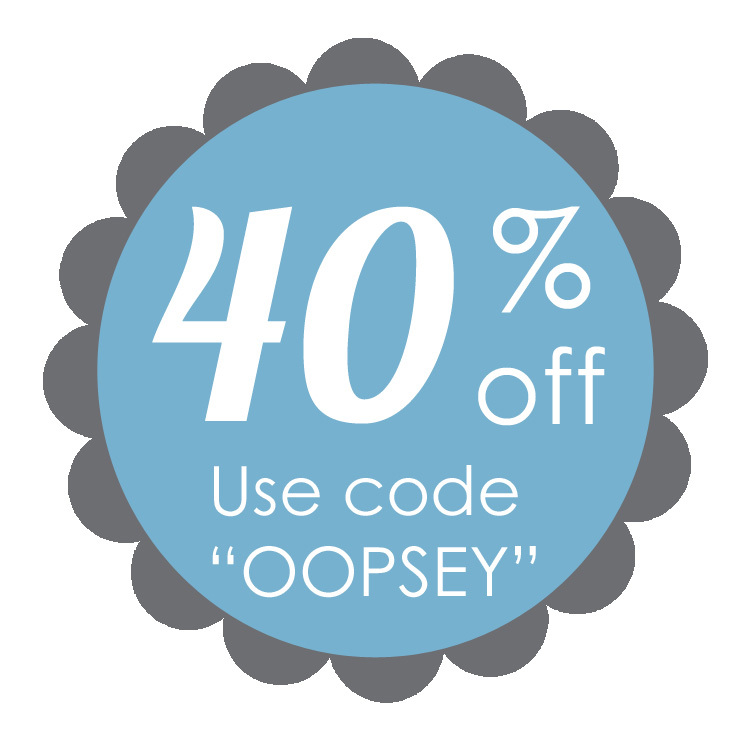 Don't forget to enter code "OOPSEY" to score 40% off just about everything in the shop! Now go enjoy your turkey! Great Deal on the Silhouette! Tonight was a big night for me. For the very first time, I used my Silhouette! I feel all grown up now. Truthfully, I've been staring it down for about a month, afraid to learn a new machine all over again. The Cricut and I have been such great friends for so long. It was an adventure though. At midnight, I was pulling my hair out because I refused to read the instructions or watch the instructional video--the video that my husband promised to watch with me accompanied by a big bowl of popcorn! But I was stubborn, determined to figure out the Silhouette through a little trial and error!! I love LOTS of things about the Silhouette machine. I love that there are so many options. You don't just cut paper. 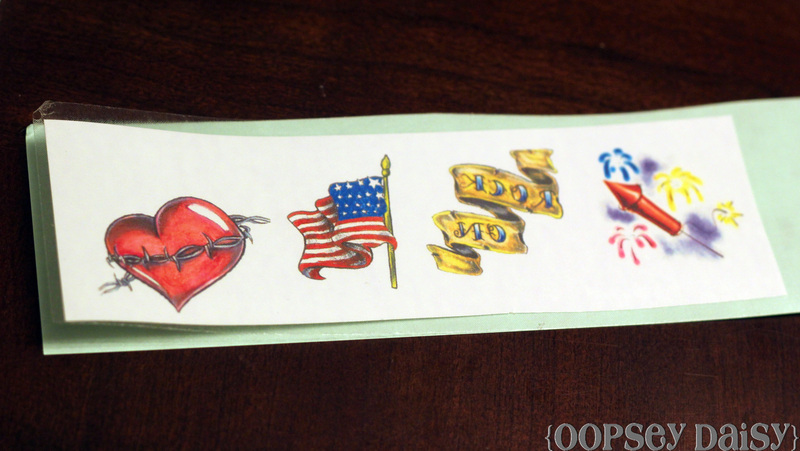 For example, you can create your very own temporary tattoos! 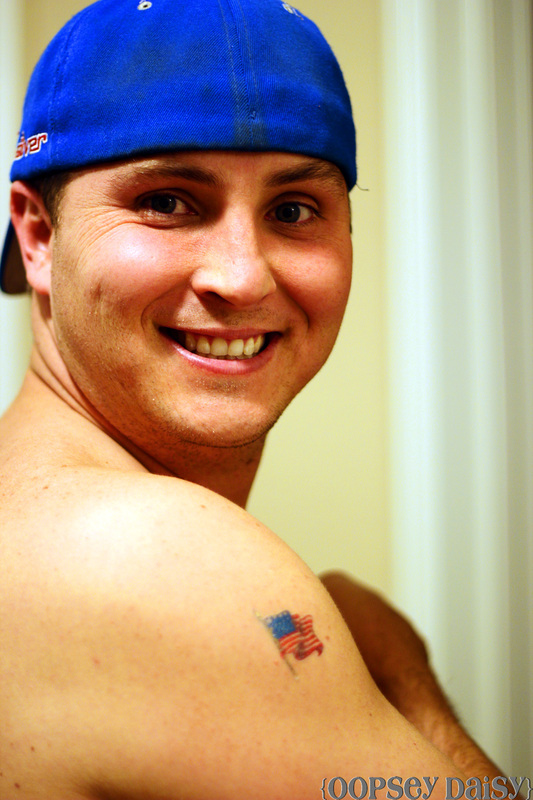 I can't wait for Little Man to wake up so he can try out his own temporary tattoo, too! After making these Silhouette images into mirror images using the Silhouette Studio software, I printed them on my printer. Following the directions, I layered it with an adhesive paper.